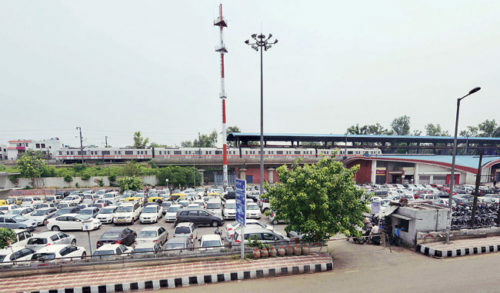 New Delhi: Fares of Delhi Metro’s parking lots will be hiked soon. With non-Metro commuters reportedly occupying most of the parking space at stations, the Delhi Metro Rail Corporation (DMRC) is planning to provide parking incentives to its smart card users. About 74 of the 96 parking lots at Metro stations remain completely packed. But, this high rate of occupancy is no good news for the DMRC as only about 15 of these facilities see a 100% usage by Metro commuters. In a bid to ward off non-Metro commuters from using these spaces, the Delhi Metro is going to revise its parking fares which is nominal compared to other agencies. “We are now thinking of changing our policy to make it at par with local agencies like the municipal corporations. The fares will be increased soon,” DMRC managing director Mangu Singh said to media. He said that the work on smart card entry to parking facilities has been expedited. “Metro smart card users will get a benefit for parking. The modalities are being worked out,” Singh said. Next articleLucknow Metro | LMRC to start trial run of first metro train on first day of December 2016.